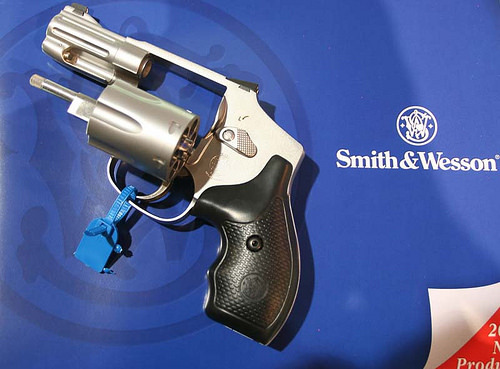 Compact revolvers have been popular almost from the birth of the wheelgun. In the 19th Century they were often pretty weak affairs, but near the dawn of the smokeless powder era, Smith and Wesson pioneered the compact, hammerless double action revolver with their “Safety Hammerless” model. While a far cry from the modern Smith and Wesson J-frame revolvers, the compact hammerless revolver has been wildly popular with the general public for well over a century, which brings us around to the M&P Bodyguard. The Bodyguard revolver is a compact hammerless .38 special, rated for +p loads, and is perhaps one of the finest compact .38’s on the market today. Naturally such a revolver almost begs for deep concealment, and so we set out to find the right concealed carry holsters for the Bodyguard revolver. And we think we’ve struck gold with the 4 best S&W Bodyguard 38 holster on the market. Inside The Pants Waistband Leather Holster for S&W Bodyguard 38. 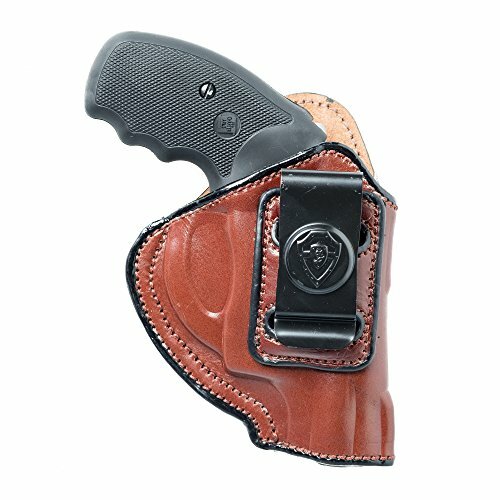 IWB Holster with Clip Conceal Carry. Brown Right Hand. Got a Bodyguard revolver, then here is one of the best IWB holsters for you. It’s almost mandatory that a revolver owner have at least one leather holster, and this would be my choice. Made of top grade cowhide, finished in a natural tan that looks great and compliments any article of clothing, and form fitted to provide a secure friction fit that is also easy to draw from, one could define all other leather IWB holsters from this model (see full specs). 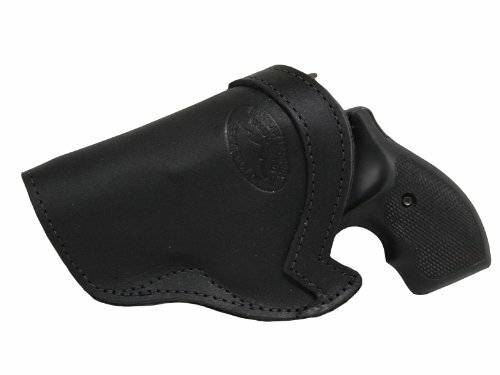 Reasonably priced, well made, highly rated, and fitted with a steel clip to secure the holster wherever you choose to wear it, this is an ideal wheelgunner’s holster. Suede isn’t just for Elvis’ blue shoes, it’s also a fantastic holster material, and a must consider when looking for the best S&W Bodyguard 38 holster. It’s a fact of life that an IWB holster may come into contact with bare skin, and the soft luxury of suede leather means what might be an irritant is barely noticeable. 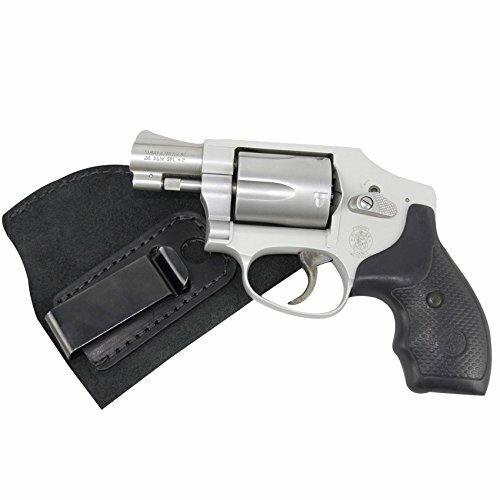 Another open top design with a metal clip to secure the holster, this easy to wear holster is just the ticket for your .38 special Bodyguard or really any other compact revolver. You already went traditional when opting for the Bodyguard revolver, go all the way with this classic open top holster. I’ve taken quite a liking to this premium holster. Made of top grade cowhide, available in left or right hand configuration, and fitted with a stout spring steel clip to hold the holster in place, this is one of the best open top IWB Bodyguard revolver holsters I’ve seen. The Barsony is Available in different sizes to fit multiple guns, be sure to order for the M&P 360 to get a fit suitable for your Bodyguard as well. The stark reality is that most any open top IWB holster will do the job, as the design is so basic and functional, there is little room for innovation. What sets New Barsony’s holster apart from others is simply the elegance of its design and construction. If you appreciate things that are a little nicer, or that evoke the spirit of days gone by, then the subtle design touches present in this holster will make it perfect for carrying your Bodyguard revolver. After you’ve picked the best S&W Bodyguard 38 holster, you should probably consider some spare ammo. While it’s rather unlikely you’ll get in a running gun battle or that you’ll even need all five shots from your revolver, it never hurts to carry spare ammo. If you are carrying your Bodyguard as a law enforcement or security professional, you may be required to carry spare ammo. To that end, I’ve always thought a speed strip was a great way to carry a reload or two for a small wheelgun. Long favored by knowledgeable handgunners and professional shooters from the days when the revolver reigned supreme, speed strips are an easy, affordable, and simple way to carry your reloads. As an added bonus, they conceal easily, so if you are going for that complete concealment look, you’ll need a couple. Despite the advances compact semi automatic pistols have made in the last few years, there is still a healthy market and valid place for the seemingly old-fashioned five-shot .38 snubby. One of the key benefits of a revolver is its near perfect reliability. Any gun can jam, either through excessive dirt, mechanical failure or faulty ammo, but the manually operated revolver is less sensitive to most things that will jam a semi-auto. 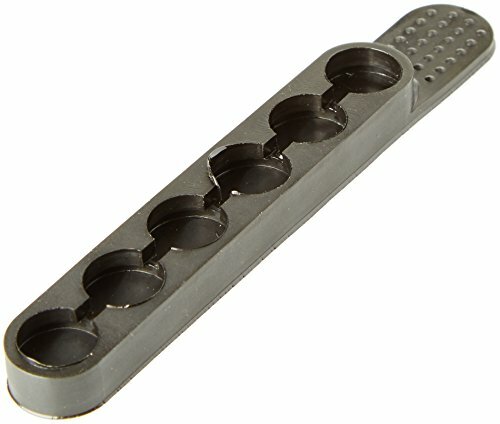 You can also shoot any kind of hollowpoint without having to worry if it will chamber or cycle your gun, you don’t have to maintain a firm grip for it to cycle each round, and there is no stiff slide to rack back to chamber a round or clear a malfunction. 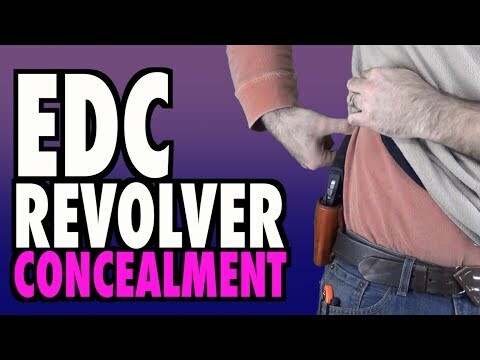 Those with hands weakened through injury will appreciate a revolver far more than a semi auto, and as an added bonus, you can shoot your gun inside your pocket without having to draw it in an emergency. There are a number of possibly apocryphal accounts of old school plainclothes cops doing just that when face to face with a hardened criminal, and that added feature of a revolver over a semi-auto has entered our popular mythology. Small revolvers like the Bodyguard lend themselves well to deep concealment, and deep concealment calls for a top quality IWB holster. Any sort with a solid spring clip to secure it, and a tight fit for your gun will do the trick. Just like the gun itself, the design is simple and having the security of a .38 snubby tucked away inside your waistband is a wonderful feeling.